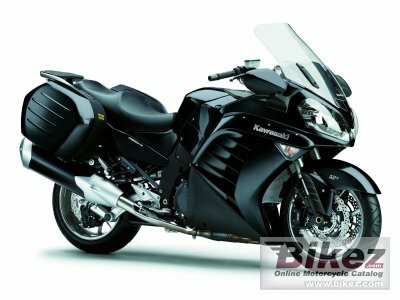 2011 Kawasaki 1400 GTR. Picture credits - Kawasaki. Submit more pictures. The GTR�s multi-function display now includes an outside air temperature monitor. Other new instrument functions include the K-ACT mode indicator, Economical Riding Indicator, and Fuel Economy Assistance Mode icon. The mode-Select button on the front of the left grip (where the passing button used to be) increases convenience by allowing the rider to change LCD modes without having to take their hand off the handlebar. Ask questions Join the 11 Kawasaki 1400 GTR discussion group or the general Kawasaki discussion group. Bikez has discussion forums for every bike. View comments, questions and answers at the 2011 Kawasaki 1400 GTR discussion group. You can sign up for e-mail notifications when other riders answer you. If you have extensive experience with the MC, please send us a review. If you consider buying this bike, you should view the list of related motorbikes Look at photos. Compare technical specs. And check out the rating of the bike's engine performance, reliability, repair costs, etc. You can compare the rating with other bikes.